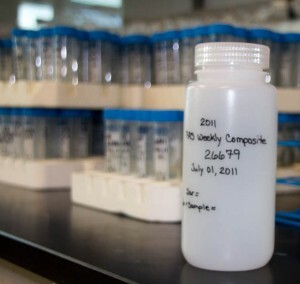 The Environmental Chemistry Department run tests on samples to detect presence of heavy metals. The samples are received from a variety of sources like WIPP, NMSU, Carlsbad Cummunity Gardens, local communities from Carlsbad and Las Cruces. The air filter samples received from WIPP them are commonly referred to as a fixed air sampler or FAS. Elemental analyses are conducted on weekly composites of these filters. Individual FAS filters are digested using a mixture of strong acids in a microwave digestion unit, and weekly composites are prepared from the digestates of the individual filters. The composites are then analyzed for a suite of trace elements with the use of a Perkin-Elmer (Model Elan 6100), Inductively Coupled Plasma-Mass Spectrometry (ICP-MS). The ICP-MS methods can provide data for up to ~35 elements, but in practice the concentrations of some elements, including As, Be, Cd, Er, Eu, Sc, Se, Sm, Tl and V are often below detectable or quantifiable levels, and a second set of elements (notably Ag, Li, and Sn) have variable concentrations in blank filters which makes their quantification difficult. Praveen Srirama is the project manager for this group. Adrienne Chancellor is the principle chemist of this department.